I'm a huge fan of sweets, but I'll be the first to admit that my tastes have changed throughout the years. I used to be a staunch supporter of rustic cafe-style cakes and stuck my nose up at fancy looking mousse cakes and the like. But times have changed, and while I still love me some orange poppyseed, elaborate gateaux - perhaps most easily recognised by their tempered chocolate work or shiny glaçages - have come a long way. Well, for some shops like Burch & Purchese anyway. Having tried some other super popular pastry shops nearby in short succession, my favourite is still B&P. I like that sends you on a rollercoaster ride of flavours and textures, and each of these elements on their own are delicious too. The flavours used are often subtle - the caramels never have that hard edge, but are instead luscious and indulgent but still packed with flavour; citruses are just sharp enough to tickle your tongue, in an unassuming but effective way, like when a bartender twists a band of zest over your drink. Textures are well thought out - fine mousses followed by just-set, cool jellies, with super crunchy, crumbly, bases or half-way breaks in the bite. (Ok, I'm obsessed, I know). 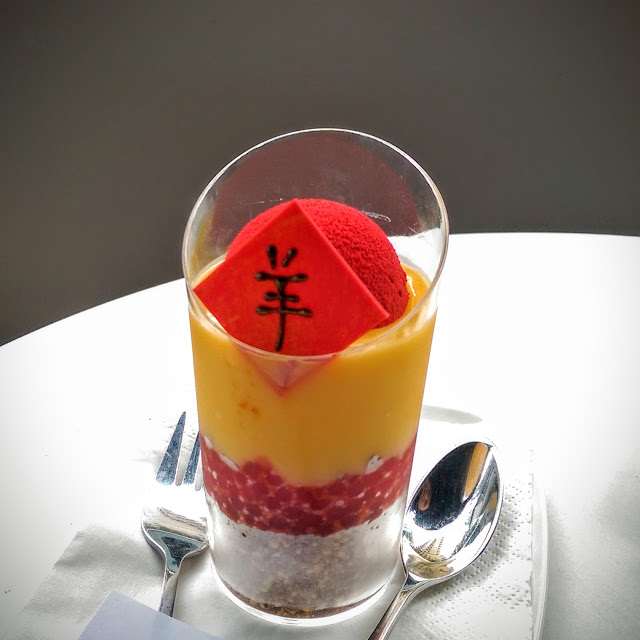 The problem I had with a nearby place (ok I'll just say it) Zumbo, is that there was always way too much gelatin. 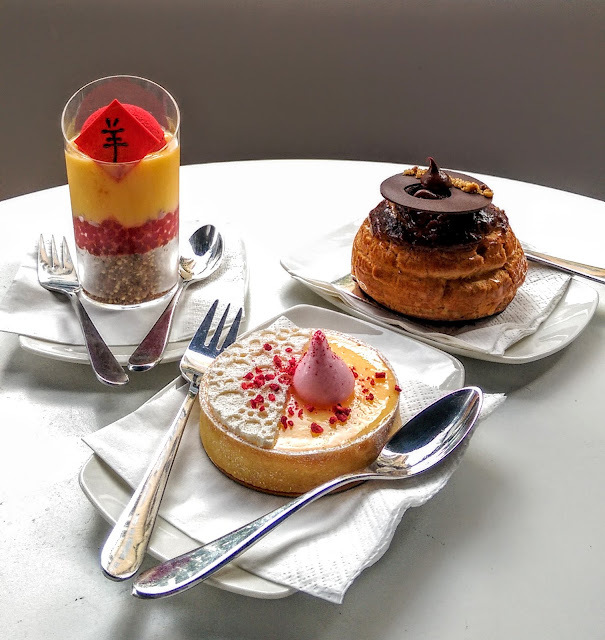 Sure, "boutique" pastry shops differ from plated desserts in that they have to last all day in the cabinet, plus the journey after leaving the shop, but adding way too much gelatin is only going to kill the balance. I'm looking at a nice dark chocolate sphere, I'm not thinking about a mouthful of vaguely chocolatey blubber. They weren't the only offenders, actually, plenty of pretty pastry boutiques I tried this time in Melbourne had the same problem. 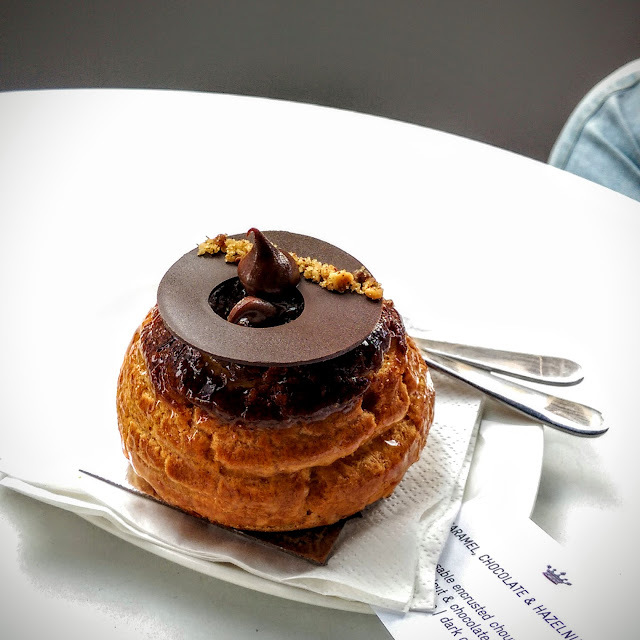 It seems like contemporary patisserie is back with a vengeance in Melbourne but I struggled to find many that delivered on style and substance. Anyway back to B&P - in the above pics you won't find any mousse cakes but I did indeed have a number of them. The glaçage was always beautiful and tasty and never gummy or wobbly like jelly. That's it really - just way too many words to say that B&P does balance and finesse like no one else can and that I'm officially a fan.